A Dog's Life: Squeaky Balls are NOT Edible. Squeaky Balls are NOT Edible. Well, that depends on how you look at it. If it goes in and comes out without the aid of a vet and surgical equipment. I'd like to say I'd learned my lesson the first time I ate a soft squeaky ball. 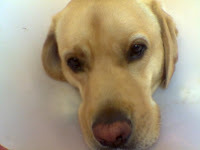 When I was whisked off immediately to the vets to have it surgically removed as it was going to cause a blockage. But five years later, I couldn't resist a squeaky ball being thrown for a much smaller dog. My excitement to hear that lovely squeak in my mouth caused me to drool so much it just kinda slipped down my throat. I was as surprised as anyone else to be honest with you and spent a little time sniffing the ground to see where it had gone. But no. It was in my big tummy. 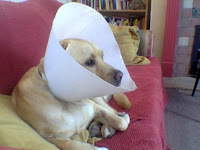 So off I went to the vets again. Mum was telling everyone how I swallowed a ball. Oh the shame! The vet gave me an injection to make me sick. Except it didn't. So they gave me another one. I was blissfully unaware of their motives and rolled over for tummy rubs until I felt bilious. But no ball appeared. After an hour of retching, they sent me home feeling drowsy from the drugs with the ball still inside. By the next day I felt much better, but still had mum following my every move. Scrutinising poos (is there no dignity for a dog?) and jumping up at the slightest burp. So life carried on pretty much the same, walks, dinners, poos, wees. Everything was normal. Mum even wondered if I'd eaten the ball at all. We also had regular phone calls from the vets to see if anything was happening. Anyone would've thought that I was about to give birth by all the fuss everyone was making. Ten days later, however. I woke up feeling nauseous. Mum was cuddling with me on the floor and I suddenly made a face. She was wise enough to move swiftly out of the way before I trotted off to the hallway and coughed up a very squashed up ball, minus the squeaker. Everyone was ecstatic. 'It's a little brown one!' they cooed! Three days later, the squeaker appeared via the back end. Even then I still didn't learn my lesson. I stole another squeaky ball from another small dog when mum's back was turned. And I enjoyed a long game of Hoomans Chase the Dog around the park until I was grabbed by my doggy friend's hooman and mum retrieved a very squashed and drooly ball, which was a whisker away from slipping down my throat. In the words of my first vet 'Labradors should come with zips on the their stomachs'. We think you are on a strict no squeaky ball diet going forward.